The idea of outer space is irresistibly romantic. There is no place more extreme, more foreign, or more beckoning. In fewer than 60 years, a total of 536 men and women have called space a (temporary) residence. Since then, we have been, as a species, reaching toward the future, working constantly to push the limits of habitability. From Lego bricks (brought to space by Japanese astronaut Satoshi Furukawa) to Marshmallow Fluff (stocked in the ISS kitchen by American astronaut Sunita Williams), we’ve slowly turned outer space into a home for humans. More recently, space has become a home for laboratory science. The expansion of biotech into space has become tremendously important as the world prepares itself for mankind’s next giant leap, the first manned mission to Mars, and confronts the undeniable fact that we are not yet ready—technologically, financially, or physiologically—for long-term space travel. Enter the ISS National Laboratory and the Genes in Space competition. There are numerous health problems associated with life in space. Loss of muscle mass and bone density (see here, here, and here) in astronauts receives a great deal of press, but the rigors of spaceflight more generally induce a number of physiological, genetic, epigenetic, transcriptomic, and metabolic changes in the human body, not to mention the psychological stresses of living in such a hostile environment. Interestingly enough, many physical symptoms experienced by astronauts mimic symptoms of aging among the elderly on Earth: increased risk of cardiovascular disease and various cancers, for example. These trends have generally been observed in astronauts living aboard the ISS. In order to research changes in human health during spaceflight, NASA and its partner organizations have established various laboratories on the ISS that are capable of analyzing astronaut health on site. As researchers delve deeper into the molecular causes of spaceflight-associated illnesses, these laboratories are evolving to facilitate molecular biology research. In recent years, if NASA scientists wished, for example, to analyze changes in the expression of a set of genes over the course of a space mission, astronaut blood samples would have to be taken during the flight, frozen, and then shipped back down to Earth for analysis; the ISS laboratories are not currently equipped for any kind of advanced biomolecular research. For more complex, long-term studies, multiple flights to and from the ISS would be required. This obviously presents a financial and technical bottleneck for advanced research into astronaut health, and it is a problem that the Genes in Space competition is helping to solve. Over the evolution of laboratory science in space—various Russian space stations, one Chinese space station, NASA’s Skylab, and now the ISS—the demand for extraterrestrial analysis of astronaut health has spawned a kind of cottage industry based on research conducted by astronauts on astronauts in low Earth orbit. In some ways, the challenges of bringing science out of planet-based academic laboratories and into space aren’t unlike the challenges faced by DIYbio enthusiasts seeking to bring science out of those insular enclaves of research that include universities and biotech companies. Functionality, portability, accessibility, and cost-efficiency are the most important qualities of laboratory equipment that’s launched to the ISS. Many standard pieces of lab equipment simply won’t work in microgravity. And still, America’s own space lab, the ISS National Laboratory, is being upgraded every day. Recently, for example, the National Lab was equipped to care for rodent astronauts; researchers have been attempting to develop the use of mice as a model system to study human health during spaceflight. And so, when I applied to the national Genes in Space competition (along with hundreds of other high school students), I was invited to propose a set of molecular biology experiments that could be performed in the ISS National Lab and might help answer some of the most pressing questions about human health in space. The invitation came, of course, with a unique set of constraints. Proposed experiments had to be original and scientifically relevant, but they also had to be feasible; they could not employ recent, popular scientific techniques like nucleic acid sequencing or flow cytometry, because the National Lab simply doesn’t have the required equipment. When I was developing my proposal, I tried to think of what current space scientists were interested in with regard to astronaut health and what experiments I could propose that, if performed, would expedite and simplify their research. I chose to center my proposal around the study of human telomeres—vital protective caps on the tips of chromosomes—in space. Abnormal telomere lengths, whether too long or too short, have been associated with a remarkable number of human diseases in various tissues. Generally, if telomeres become critically short, cells will enter a state of senescence in which cell division ceases. As human bodies age, senescent cells naturally build up in various tissues. The connections between physiological stress and aberrant regulation of telomere length have been well documented. It is hypothesized by scientists that the stresses astronauts experience during spaceflight, such as poor quality of sleep, inadequate nutrition, microgravity, and cosmic radiation, may lead to changes in telomere dynamics during space missions, and in turn, to tissue-specific senescence and symptoms of disease. This hypothesis is currently being tested by the ongoing NASA Twins study, a comprehensive analysis of the changes that occurred in astronaut Scott Kelly’s body over the course of nearly a year in space. Since the ISS National Lab’s resources are so sparse, the need for tools for research is almost more urgent than the research itself. When developing my proposal, I was concerned primarily with the measurement of changes in telomere dynamics. I proposed the in-space validation of an assay which uses traditional polymerase chain reaction (PCR) technology to measure changes in telomere lengths. 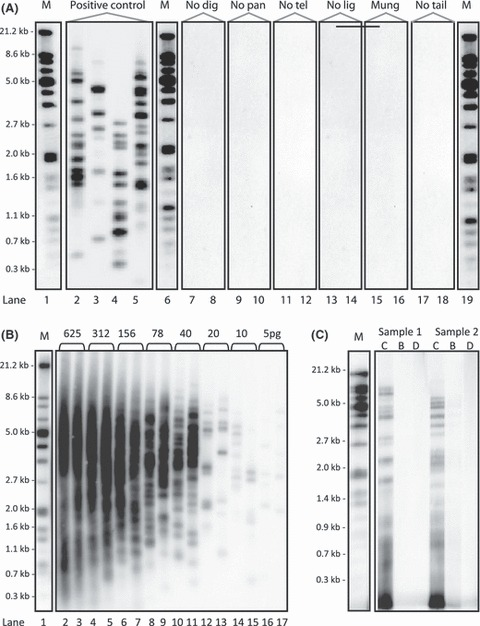 The assay I want to use was developed to measure telomere lengths on Earth by amplifying and visualizing them (Figure 1-1), but—with specific modifications—is uniquely suited to use on the ISS. All the same, part of the proposal was imagining how others could build upon my experiments after their completion. With the generous assistance of my mentor, Deniz Atabay, an MIT PhD student in neurobiology, I designed a hypothetical study of telomere dynamics in a human organoid model system, cultured human cells that are capable of forming primitive organ structures, aboard the ISS. The design made use of specific organoids—myocardial organoids, for example, mimic the form of the heart—that could be cultured on the ISS over long stretches of time. Periodically, DNA could be sampled from the organoid cultures, and telomere lengths could be assessed with the appropriate assay. Such an investigation would allow researchers to answer questions about changes in the regulation of telomere length in different human tissues and organ systems in real time, on site. In June 2016, I traveled to San Diego to attend the ISS Research and Development conference, my first scientific conference. While there, I presented my proposal to a group of judges and was chosen as the winner of the Genes in Space competition. My experiments, which I’ve been preparing since I returned home from the conference, are scheduled to be launched to the ISS in late March, 2017. When they arrive, they will be unpacked and executed by an astronaut. For me and, I imagine, many other high school students, Genes in Space is unique in that its primary aim is not to reward work already done by the student, but to provide the student an opportunity to expand the scope and elevate the significance of his or her work by sending it to the ISS. It’s an opportunity that, most of the time, is only available to late-career government scientists. The value of this opportunity is compounded, counterintuitively, by the state of laboratory research on the ISS. Despite great demand for scientific data obtained aboard the space station, the difficulties of performing experiments while orbiting the Earth mean that outer space molecular biology is still in its very early stages. As a result, a high school student, as unreal as this sounded to me at first, can contribute to mainstream science in legitimate and significant ways. The first polymerase chain reaction, the assay on which all molecular biology is based, performed in space was designed by Anna-Sophia Boguraev, the 2015 Genes in Space winner. My experiments will test the capability of two DNA polymerases to amplify highly repetitive nucleotide sequences in orbit. They will also involve the first colorimetric loop-mediated isothermal amplification of DNA (LAMP) ever performed in space. Genes in Space allowed me to make the jump from my personal science education to the real progression of human knowledge and capability. The novelty of this cannot be overstated. 1Bendix, Laila, Peer Bendix Horn, Uffe Birk Jensen, Ivica Rubelj, and Steen Kolvraa. "The Load of Short Telomeres, Estimated by a New Method, Universal STELA, Correlates with Number of Senescent Cells." Aging Cell 9.3 (2010): 383-97. Web. Article image: NASA astronaut Greg Chamitoff conducting extravehicular activity (EVA) on the International Space Station, 2011. (source: NASA/Michael Fincke on Wikimedia Commons).